Domtar maintenance employee Rick Zelehoski didn’t think the plant manager would go for a fish hatchery in an old filtration building dating back to the early 1900s. But why not ask? In 1992, he posed the question to his boss at the Johnsonburg Mill, which was then part of Willamette Industries. It was an unusual arrangement at the time, but it has become a beneficial one. 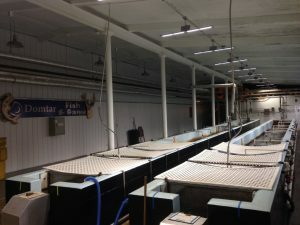 Zelehoski and his colleagues at the mill in Johnsonburg, Pennsylvania, enjoy getting the juvenile fish and raising them. Volunteers have built two raceways — each 88 feet long and 4 feet wide — that sit above the floor, where the young brook, brown and rainbow trout flip, flop and swim. Inside the Johnsonburg Mill fish hatchery. More than 25 volunteers, all of whom are current or retired mill employees, feed the fish twice a day and keep an eye on their health. When the fish reach an appropriate size, they are released into area springs. About 10,000 are released each year. The cooperative hatchery has received awards from the state for its success. The TomBob Outdoors cable TV show, “Friends in Wild Places,” is also planning to feature the fish hatchery and its contribution to the community. In each of the past several years, the fish hatchery has hosted a family day and spring fishing event for children of employees. 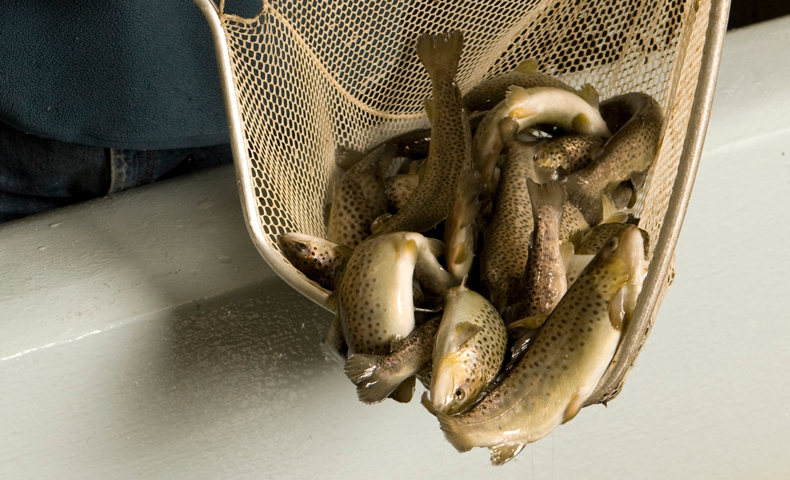 For some children, a Domtar trout may be the first fish they catch. Charles DeWitt, quality and technical manager at the mill, said the hatchery is a highlight when groups tour the mill, and it opens the door to conversations about Domtar’s commitment to sustainability and the communities in which it operates. Zelehoski, who is planning to retire from his maintenance job at the mill this year, has said he’ll be back to volunteer in the hatchery. He says he used to enjoy trout fishing, but he hasn’t done it much in the nearly 25 years he’s been working in the hatchery. Maybe it’s because he doesn’t have as much time. Or maybe, as DeWitt teases, it’s because he has named all of those little trout.